Enchanting Cottage in the Unrivaled Kiva Dunes Golf and Seaside Community. Feel the warmth of the sun, the sand beneath your toes and the smell of suntan oil as you spend some lazy days in this picturesque cottage. Located in the magnificent golf and seaside community Kiva Dunes, this sun kissed house has everything you are looking for. 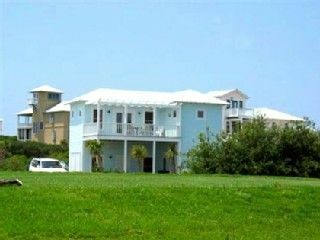 With two bedrooms and two baths, this humble beach abode sleeps 4 comfortably. There is a queen size bed in the master bedroom and two twins in the second bedroom. Wood floors, ceiling fans for that 'southern comfort' feeling. The kitchen is fully equipped for your culinary needs and will inspire you to sip ice tea and eat boiled shrimp out on the airy porches. After an evening out under the stars, come in and enjoy a movie on cable TV, or VCR, DVD, or your favorite music on the FM/CD player. We also have playing cards, board games, and a small VCR/DVD library of films. Free Wi-Fi. What to Do: A nearby walkway leads you over the white dunes and sea oats to the cool surf where sand crabs scurry about on our community's private beach. Delight in chartered fishing excursions, championship golf, nature walks, outlet shopping, amusement parks, wonderful restaurants, on site tennis, or swimming in any of the three private community pools or relax at an adjacent resort nearby which has a day spa. We now have obtained a membership for our guests in the private Kiva Dunes Beach Club Pool and Grill where you can relax, eat outside, enjoy the beach, hot tub, and get a massage! Just register at the main clubhouse with your CC to get your wristband. We also now have a free golf cart shuttle service. Make your way to the Gulf of Mexico this year and immerse yourself into the warmth of this southern coastal cottage. What You Get Along with your Private Beach:: BR B Amenities: /B BR 2 Bedroom, 2 Bath, 1 Queen bed, 2 twins, living room, spacious porches, master suite w/bathroom, outside shower, washer and dryer, ceiling fans, central A/C, cable television, TVs in each bedroom, stereo with CD and cassette player, VCR, DVD, movies & board games, fully equipped kitchen, BBQ pit, deck with golf course view, seconds from beach access walkway over the dunes to 3,000 feet of private beach; 3 private community swimming pools, tennis courts, equipped exercise room, golf pro shop & restaurant, and famous Kiva Dunes' nationally ranked championship golf all on site. The #1 golf course in Alabama! BR B Activities: /B BR Amusement parks, biplane rides, charter fishing (deep sea and inshore), canoeing, championship golf courses, dolphin-watching tours, exercise weight room, movie theaters, outlet mall shopping, putt-putt, restaurants, 3 pools, tennis courts, Blue Angels Naval Air station and aviation museum, water sports, water park, Zoo, Dauphin Island sea-aquarium and ferry, nature walks, trails & bird watching (Bonsecour Nature Preserve), Fort Morgan museum. And oh yeah, the 13th hole is right out your back door! eCheck is the safe and preferred payment method. Inside or Outside on the deck! NEW FEATURE! Our guests may use the private Kiva Dunes Beach CLub beachside Pool, Barr and Grill .Just register at the front desk in the main Resort/Golf building with CC to receive your wrist band. Master BR downstairs, 1 queen. guest BR upstairs 2 twin beds. Golf: World Class Kiva Dunes Golf course. Rated #1 in Alabama, Jerry Pate designed course. Only Golf course on the Beach!